See, extra busy with Halloween decorating! In the process of looking for assorted decorations, I came across this cute little pumpkin. I'm pretty sure Shaun brought him home from the office one year, in a goodie bag from a mortgage or title company or something. I love when companies are schmoozing him with neat litlte gifts. Ones that send cookies are good too. Anyhow, back to the bento! Ben has a ham and cheese sandwich on whole grain bread. I decided to use our Linzer cookie maker for cute sandwiches again, love the little pumpkin cut out with the cheese peeking through. He also has some veggie chips and carrot sticks on that side and lots of fresh cantaloupe and strawberries on the other side, accented with our pumpkin and ghost picks of course. I really want to make something pumpkin for treats. Last week's pumpkin spice cake was awesome. Maybe pumpkin cheesecake this week? Or pumpkin chocolate chip cookies sounds so good right now ... Whatever we decide, it will probably be tomorrow's Kids Cook Monday, so check back to see what goodies we came up with. if you haven't tried Paula Dean's Pumpkin ooey gooey butter cake, it is heavenly. the recipe should be on foodnetwork.com but I think made individual cakes. I made a 13x9 size lasagna pan of it and it turned out great...It really is so good. It's like a pumpkin cheesecake with a cookie cake crust. Love the linzer sandwich, it's too cute!! Pumpkin whoopie pies are on my agenda this week :D can't wait to see what you make! make pumpkin bread! perfect for bento treats! 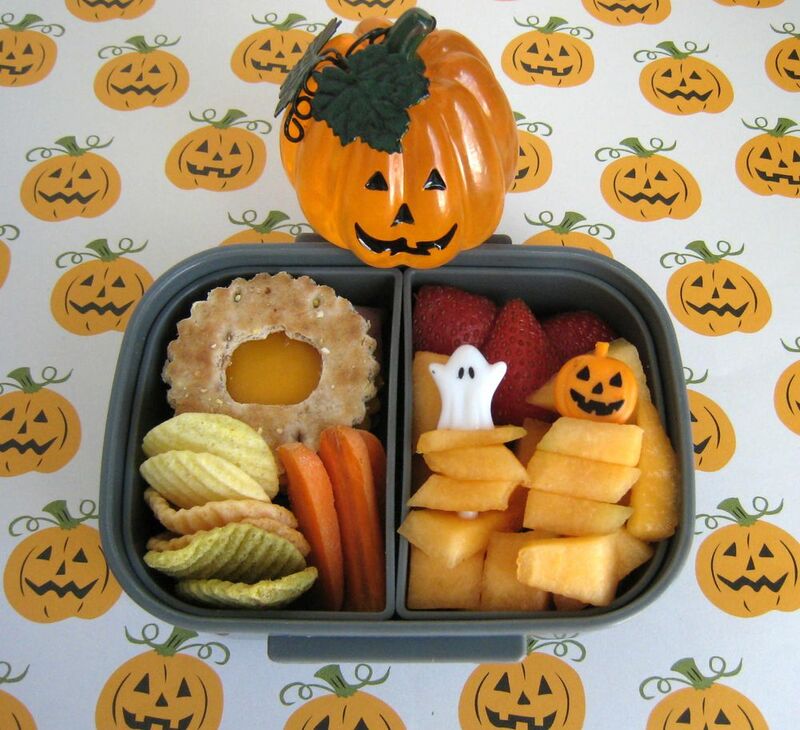 The pumpkin is adorable, the food looks delish and the picks rock!